It’s the ultimate doomsday scenario: Astronomers spot an enormous miles-wide asteroid headed for a collision course with Earth. An impact with our planet means a fiery goodbye to civilization—and life—as we know it, and there are only a few short weeks to rally together a plucky group of oil drillers the citizens of the world to somehow fight this apocalyptic threat. Fortunately, it’s doubtful we’ll ever be faced with this kind of sudden Armageddon. NASA, other government space agencies, and astronomers across the world have a pretty solid way of tracking huge, civilization-destroying asteroids, mapping their trajectories many years or decades in advance before they might head our way. Such ample warning would give us more than enough time to prepare some kind of deflection strategy. Instead, it’s the smaller and “medium-sized” asteroids we need to worry about—those ranging from 100 to 1,000 feet in diameter. That’s according to the Emergency Asteroid Defence Project based out of Copenhagen, Denmark. A non-profit organization comprised of engineers and science entrepreneurs, the EADP is trying to increase awareness about the threats posed by these less domineering asteroids. They argue that because of their smaller size, the space rocks are harder to spot many years in advance, perhaps going undetected until just a few a short weeks before they crash. And if scientists find one to be headed toward a major city, the impact could be on par with that of an atomic blast. via Scientists Are Crowdfunding Spacecraft To Blast Asteroids Out Of The Sky | Popular Science. “Preliminary data from NASA’s Lunar Crater Observation and Sensing Satellite, or LCROSS, indicates the mission successfully uncovered water in a permanently shadowed lunar crater. The discovery opens a new chapter in our understanding of the moon. Author rjbaileyPosted on November 14, 2009 Categories UncategorizedTags LCROSS, Lunar Crater Observation and Sensing Satellite, Lunar Precursor Robotic Program, Lunar Reconnaissance Orbiter, Moon, NASA, Spacecraft1 Comment on Water on the Moon? “WASHINGTON, July 17 /PRNewswire-USNewswire/ — NASA’s Lunar Reconnaissance Orbiter, or LRO, has returned its first imagery of the Apollo moon landing sites. The pictures show the Apollo missions’ lunar module descent stages sitting on the moon‘s surface, as long shadows from a low sun angle make the modules’ locations evident. “The Lunar Reconnaissance Orbiter Camera, or LROC, was able to image five of the six Apollo sites, with the remaining Apollo 12 site expected to be photographed in the coming weeks. “WASHINGTON, May 21 /PRNewswire-USNewswire/ — NASA’s return to the moon will get a boost in June with the launch of two satellites that will return a wealth of data about Earth’s nearest neighbor. 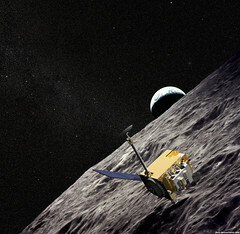 On Thursday, the agency outlined the upcoming missions of the Lunar Reconnaissance Orbiter, or LRO, and the Lunar Crater Observation and Sensing Satellite, or LCROSS. The spacecraft will launch together June 17 aboard an Atlas V rocket from Cape Canaveral Air Force Station in Florida. Forwarded from a SpaceWeather email I got earlier. Space and Astronautics News » Blog Archive » NASA Tests Engine for New Manned Moon Landings.